It snowed last night. The sticky, wet, turn-everything-white kind of snow. The right kind of snow. So, naturally we went for an earlier run today. To get in the sight before the crowds (or the sun) spoilt it. Chewie to me: Lets get started already! First up: I’ve got new shoes! … and I don’t love them. 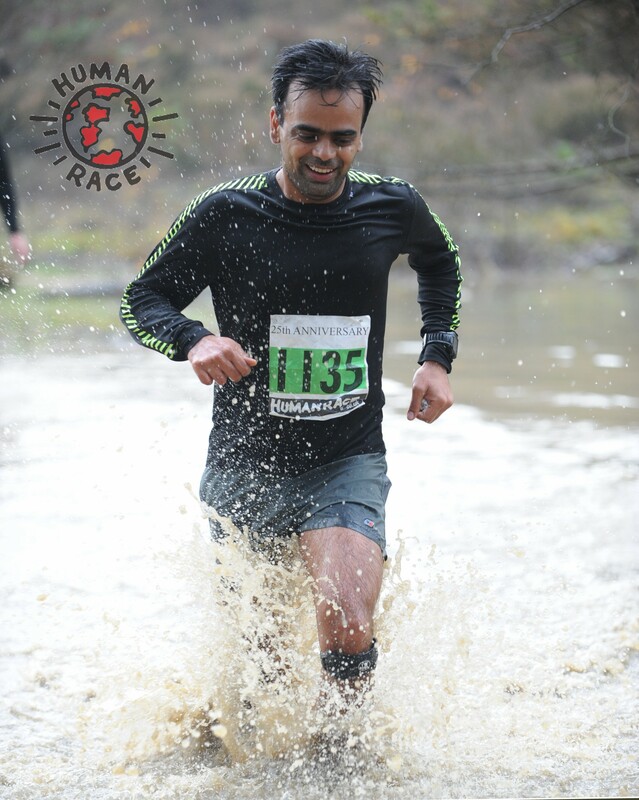 It was the a truly autumnal weekend – persistent rain, chill in the air, muddy trails, flooding on the roads, and return of Human Race’s trail run series. It was also the weekend I decided to move into 2nd gear with my preps for next year’s run and ride fiesta. After our move to Guildford last October, I started taking Chewie along for my runs. Couldn’t let all the trails of Mount/Hogs-Back behind our backyard go waste, after all. As we graduated from our slow, me-pestering-him-to-stop-jumping-at-me runs to the still slow, him-giving-me-the-look-asking-me-to-keep-up runs, Raghi suggested that we try out a canicross trail run. That was the start, last autumn, of our trail running events. Not wanting to let her get all the mud fun alone, Chewie and I too registered for Wildman, which we’d missed last year after I got a back spasm the week before. Saturday morning. Temperature was mild, for time of the year. Rain was inconsistent, but enough had fallen over the preceding weeks to leave lots of bogs and floods all over the course. Spirits were high, except in Chewie, who was wondering why on earth were we out in the soggy woods this early on Saturday morning. That was till he saw the dozens of other dogs, and smelled the sausages being grilled. After a tiny bit of stretching, and drinking a couple of bottles of water + VitaCoco (each! ), it was time to head for the final trail running ritual – Sausages! Rags and I got ours with the bun, ketchup and mayo on top, while Chewie got his clean. 10K in the mud, warm sausage in the stomach – he was ready to sleep for rest of the day. Training for Fred Whitton 2015 means, I’ve got to (learn to love to) ride in all weathers. This Sunday, it meant a 50K ride in non-stop rain, on roads that were either flooded, or layered with mud. Or both. My wuss’ plan as I headed out was an easy 25K ride: Home – Compton – Wonersh – Black Heath – St. Martha – Compton – Home. Once on the road, I discovered an unexpected side-benefit of riding in crappy weather on Sunday afternoons – no traffic on the roads! 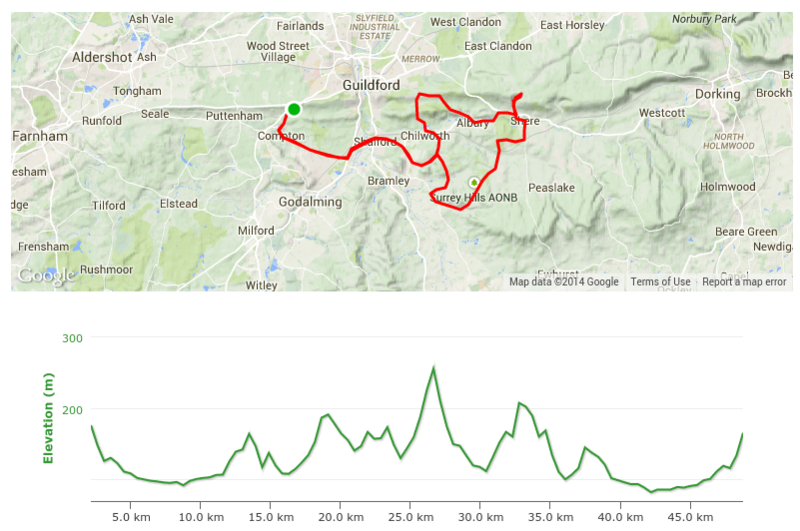 The ride plan soon changed into: Home – Compton – Wonersh – Black Heath (from Wonersh) – Shamley Green – Framley Green – Shere – Up Coombe Lane – Down Coombe Lane – Albury – Up Guildford Lane – Down St. Martha – Black Heath (from Chilworth) – Wonersh – Compton – Home. 3 easy climbs turned into 6, and then some. However, there wasn’t one moment when I didn’t enjoy the ride. Not when, in the middle of a descent I was suddenly faced with a 50m long, flooded section of a single-track road. The car on the other side patiently waited for me to slowly, and carefully ride across the middle. Not when, climbing hard out-of-the-saddle, I take a corner to see the whole road covered in an inch-thick layer of mud. My skills staying upright almost convinced me to take up cyclocross. Not even when, the mountain biker standing around at St. Martha – first other cyclist I saw on the whole ride – didn’t return my hello! Not when the boy racer overtook me dangerously closely while I was climbing up Guildford Ln. It helped that the car behind him kept his respectful distance and waited for me to slow down into a passing place, and then thanked me for giving him space. And definitely not the innumerable times when the chain refused to shift into the large chainring. Even stopped and did it by hand a couple of times. It helped that while it was wet, the temperatures weren’t really low – hovering in low double digits for most of my ride. Climbing half a dozen hills also meant that the body got enough opportunity to keep the boiler running, and keep me warm. While on the ride, I realised how much I love running-riding-hiking in wet, mildly-cold weather. On the other hand, for a fella who grew up in 45°C heat, I wither surprisingly fast in even 28°C summers we have here. I wonder if I’ll still love these wet rides once the temperature drops into low single digits, and the wind starts howling? Getting the miles in then could make-or-break my FW2015 plans. And, that was the first mud, flood, and fun weekend of the autumn. Time to gird up for the next one. When I say experience counts in trail running, I mean it. Last year, like most leading-edge runners and most newbies, I was trying to run up every hill, sprint down every descent, and reaching the finish crawling on all fours. Lesson learnt. This year, I was walking up (as fast as I could) most of those short-steep climbs, jogging up the long-steady ones, and using all the saved energy to put in a much better time on the remaining 80% of the course. Rags, on the other hand, despite my advice, was running up all the climbs. Or as many as she could, and then shattering to pieces on top of each one, unable to use the descents or flats to get anywhere. The other bit where experience helped was in communication with Chewie. Last year, he used to pull me up-hill, down-hill, off-trail, on-trail, and then just sit up once knackered, demanding to be carried home. Running, and walking, together over the year has helped us both get a few bits drilled out. He pulls uphill, on command, and goes downhill gently, on command. When he starts getting tired, instead of pulling himself to collapse, he starts running an easier pace – my pace. He also has a lot more stamina, so that helps too. That, and our shared love of hot dogs!